The World's Tallest Water Sphere » Blog Archive » World’s Tallest Water Sphere? 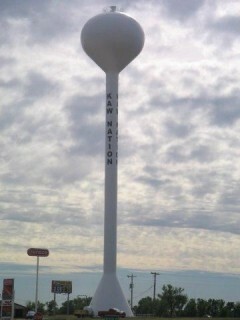 A reader writes to this site to say that Union no longer has the world’s tallest water tower. In fact the person suggests we rename the domain “worldssecondtallestwatersphere”. A photo is attached and a link is given to information on a new 221 foot water tower in Braman, Okalahoma, built in May of 2010. Well, that sure is a beautiful water tower, and the white paint job must look great against a deep blue Oklahoma sky. However, and we have stated this before, the World’s Tallest Water Sphere of Union, New Jersey is still the world’s tallest water sphere. If you look closely at the Braman tower, you can see that the top of the tower is not spherical. Ignore that conical neck collar underneath the dome for now, many towers have such a pedestal for added strength and volume. Look at the outline of the top of the tower. It is quite squashed and flattened. The Braman tower is in fact a water spheroid, not a water sphere. The spheroid is inferior to the sphere. The spheroid looks like it has been deflated. The spheroid is less regular than a sphere. Imagine how silly the World Cup tournament would be played with a spheroid. Imagine trying to calculate the volume of a spheroid without a calculator. Imagine all the people living life in spheroids. Some may marvel at tall water towers. Some may marvel at new water towers. However, we marvel at water spheres. The tall kind. The ones with a ball at the top. This site is dedicated to the World’s Tallest Water Sphere. This entry was posted on Wednesday, December 22nd, 2010 at 3:38 pm	and is filed under Competitors, Photos. You can follow any responses to this entry through the RSS 2.0 feed. Both comments and pings are currently closed.